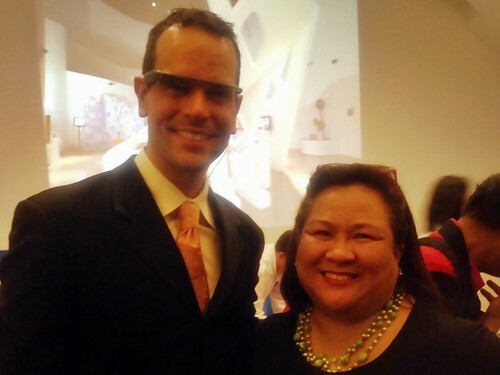 Me and Dr. Ned Sahin, seen here sporting the Google Glass that houses the Brain Power LLC’s adaptive technology for individuals with autism. The Autism Society Philippines was privileged to be among the forward-thinking organizations who participated in “The Era of Brain Technologies” delivered by Dr. Ned Sahin at the Mind Museum Taguig last 14 November 2014 — part of a series of Executive Talks organized by First Pacific Leadership Academy. I was a parent-slash-advocate-slash-technologist among industry leaders, software developers, autism advocates and educators from ASP institutional members (such as Bridges Foundation, CARD, ILLC, Shine and TLC). Dr. Ned Sahin is a neuroscientist and neurotechnology entrepreneur. He hold degrees in neuroscience from Williams College (BA), MIT (Master’s), and Harvard (PhD) and did a year of study at Oxford and post-doctoral fellowships at UCSD Medical School and the Salk Institute in San Diego. Dr. Sahin’s talk first dealt with what current brain research today is making possible; and the great strides happening in wearable technology and implants, to monitor cognitive functions of individuals in high stress situations, such as soldiers; and to assist patients with disabilities correlated to reduced brain functions. Dr. Sahim prefaced his talk on the work of Brain Power LLC with what many do not know about autism — “There is no medical procedure that can test autism. There are no remarkable physiological differences in an autistic brain. Autism can be detected only through behavior.” I found endearing his compassionate understanding of autism and the effect the condition has on the person with autism and the family. Dr. Sahin’s work on wearable technology for individuals with autism was the highlight of the afternoon. Using Google Glass (a computing eyewear with an optical head-mounted display and Google’s first attempt at mass-market ubiquitous technology), Dr. Sahin has developed software and hardware to help address the main deficits of autism and the needs of the family members and caregivers. His technology assists the individual with autism by developing attention span, tolerance to visual stimuli, metalinguistic skills, and capabilities for emotional decoding. The solution is able to address autism’s social and language deficits through its ability to quantify behavior (for example, percentage a PWA looks when his name is called) and count movement (such as blinking of the eyes or bowing of the head); through gamification that rewards desired behavior; through algorithms that analyze facial patterns; among many others. Dr. Sahin showed videos of children and young adults with autism trying on the headgear for the first time and adapting with success; as well as images of Dr. Temple Grandin geeking out over this new technology. So what lies in the future of autism tech? Dr. Sahin emphasized the role technology and the “internet of things” will play in the coming years, especially in terms of augmenting normal human cognitive abilities. He shared his excitement over the possibility of contextual, predictive and prescriptive analytics. Insight from large data sets captured by the Google glass can revolutionize how individuals with autism interact with the world and how the world understands autism. We look forward to the day the technology becomes commercial and makes it to the Philippine shores!